When Tesla launched a first called the world show in 2008, no one would have imagined that they are witnessing the birth of an automotive giant. The company has grown so much that it has become a major influencer in the automotive industry. While the Tesla was moving forward in the electric car technology, the mainstream car makers remain skeptical about the longevity of the electric car business. Fast-forward to 2019, now everyone wants to make their own electric cars. Porsche was the first mainstream manufacturers to present the world with its true Rival- the Porsche Mission E. Here are the five things that you need to know about Porsche’s upcoming electric sports car. The Mission E will be an all-wheel-drive electric car with two permanent magnet synchronous motors at each axle. The two electric motors are expected to produce more than 440 kW. All four wheels are individually controlled by the Porsche Torque Vectoring system. Combine these two models produces 605 brake horsepower which is enough to take this portion from 0 to 100 km/h in just 3.5 seconds, 0 to 200 km/h in under 12 seconds and the top speed over 250 km/h. This is actually less than the Tesla Model S which can go 0 to 100 km/h in just 2.5 seconds but Porsches performance figure attend to be on the conservative side which means then there’s a small chance that this car might be faster than what Porsche claims. There is no data actual data is available about the battery size what Porsche is claiming a 500 kms or 310 miles range on a single charge which is pretty decent. Porsche is looking to bring the spirit of the sports car into the electric world and that’s quite evident from the spy pics where the Porsche was testing the Mission E at the Nurburgring. This car will be built upon an entirely new platform which means then it’s not a Panamera with a couple of electric motors. The entire passenger tub or white shaft train has Porsche calls in will be made out of carbon fiber and the batteries will be mounted as long as possible within this composite structure for an ultra low center of gravity just like the Tesla. Porsche is aiming to achieve a sub 8 minute Club in the Nurburgring with this car. This platform will also be used by Audi for their upcoming all-electric SUV for Audi E-Tron. Sometimes when a stunning concept car goes into production it ends up being down or even boring but the Porsches are not like that. Take the 918 spyder for example, for an untrained eye it might be a bit hard to tell the difference between the concept car and production version. The CEO of Porsche Mr.Oliver Blume have said that the production version will be quite similar to the concept with a few changes. For example, the concept car utilized holographic displays instead of rear-wheel rivers giving it a nice clean look but the actual production version will hammer us due to some safety regulations. One of the biggest gripe that many people have with electric cars is the recharging time. The Tesla’s supercharging station takes about 30 minutes to recharge for a 272 kilometers of 170 mph range. when you are out on a long road trip it might get annoying. In order to address this issue Porsche has incorporated an 800 volt charging system that is Porsche Turbo Charging system which will be able to recharge the car for a 400 kilometer or 250 mile range in just 15 minutes. Porsche claims that this system can charge the battery to 80% in just 15 minutes. 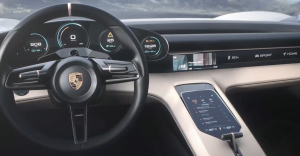 These 800 volt charging stations are not going to be everywhere and the Porsche is well aware of that so the Mission E will be able to charge from a 400 volt system or from the household buzzer. The main rival of the Mission E is going to be the Tesla Model S. the car magazine has got their hands on this fire pick where the Porsche was caught benchmarking the Mission E with a bunch of Tesla cars so the Porsche will price the Mission E accordingly but in the Porsche lineup the Mission E will be placed between the Panamera and the Porsche 911. When the Mission E was introduced for the first time in 2015, Porsche told us that it will be on sale by 2020 but the recent reports confirm that the car will be ready by the end of 2019 and it will make its debut in Frankfurt Motor Show. Mr. Oliver Blume also pointed out that Mission E will have different variants following the Porsches same moral hierarchy which means then we can expect variants like Mission E S and Mission E GT. 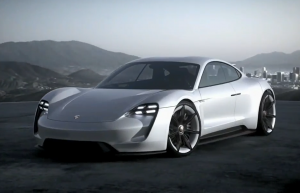 So these are some key information about the new Tesla rival from Porsche, If you have any quries regarding this post then comment in the comment section below.